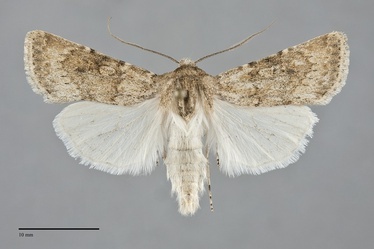 Euxoa cona is an uncommon late fall-flying medium-sized Euxoa (FW length 15–18 mm) with strongly mottled and powdery light gray-brown forewings that vary in darkness, dark markings that include an oval orbicular spot lacking an ocellus and a toothed postmedial line, and whitish hindwings that flies in steppe habitats as far north as southern Washington. 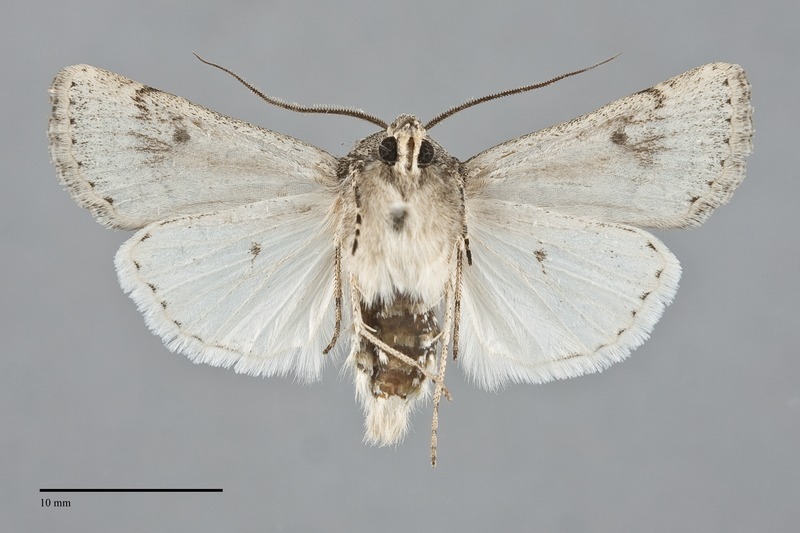 The forewing is relatively long with a pointed apex. The ground color varies considerably, usually cream, orange-tan, or light brown-gray with a light to very heavy suffusion of dark scales. The median area and distal wing are often mottled with gray, with the costa near the subterminal line and terminal area, including the apex, consistently dark gray. The cell is often dark. The veins are not darker than the adjacent wing. The basal and antemedial lines are powdery gray bordered by a light shade of the ground color, and vary from faint to dark. The antemedial lines is slightly irregular and is angled slightly toward the outer margin. The median line is faint, a diffuse dark shade. The postmedial line is usually more sharply-defined than the other lines, dark gray and strongly toothed on the veins, it is drawn basad on the costa, is smoothly and narrowly convex on the anterior wing, and nearly straight or slightly concave from the mid-cell to the posterior margin at a 45° slant. The subterminal line is a pale shade of the ground color, powdery, usually complete but sometimes broken into spots, nearly even to slightly irregular. It is preceded by a dark spot on the costa and a weak powdery gray shade elsewhere. The terminal line is variable, often a series of large black triangles. The fringe is variable, cream, tan, or gray, sometimes with a tan or weakly checkered base. The orbicular and reniform spots outlined in powdery dark gray to black and are moderately large. The orbicular spot is oval, often open anteriorly and posteriorly, filled with a light shade of the ground color or pale gray, usually homogenous but rarely containing a faint ocellus. The reniform spot is broadly kidney-shaped, usually incomplete anteriorly and posteriorly, filled anteriorly with powdery ground color or a lighter shade and darker gray at the lower end. The claviform spot is most often absent, small and thin when present. 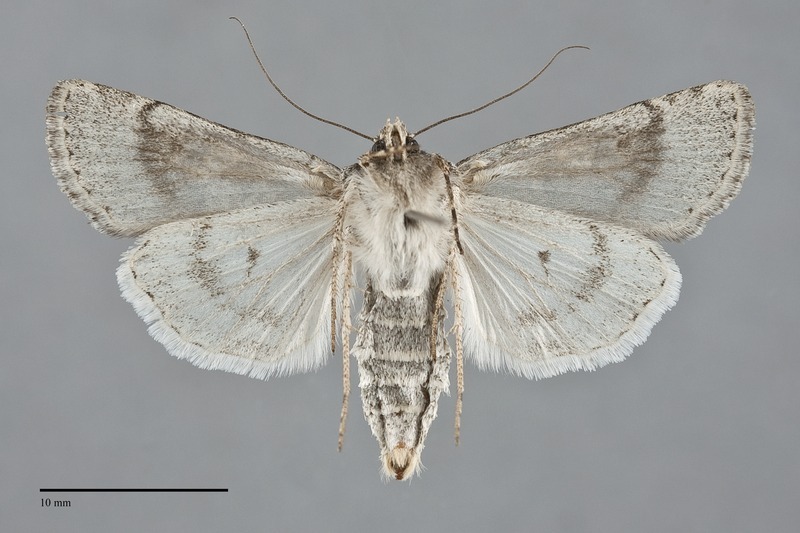 The male hindwing is pure white, often with a continues or broken terminal line and sometimes with a weak gray marginal shade; that of females off-white with a brown-gray suffusion, and gray discal spot, postmedial line, veins, and terminal line. 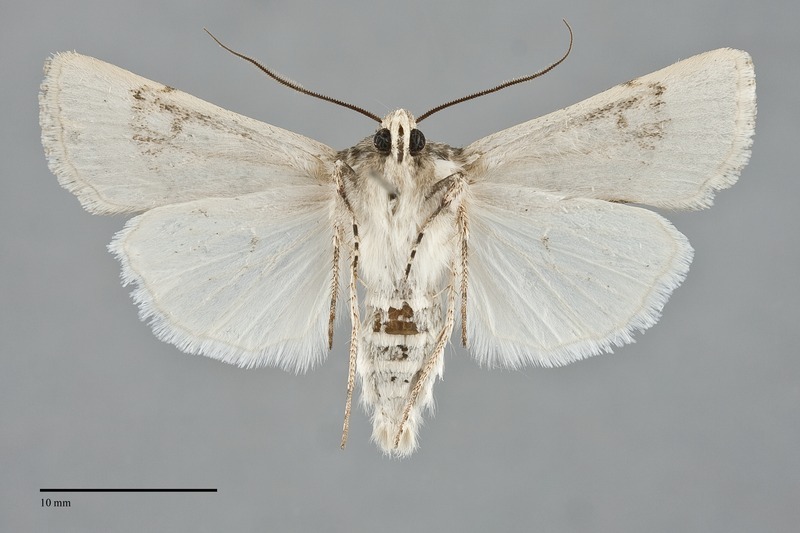 The hindwing fringe is pure white in both sexes. The head and thorax match the forewing color and are powdery. A frontal tubercle is present. The male antenna is weakly bipectinate with long fasciculae, appearing wide. 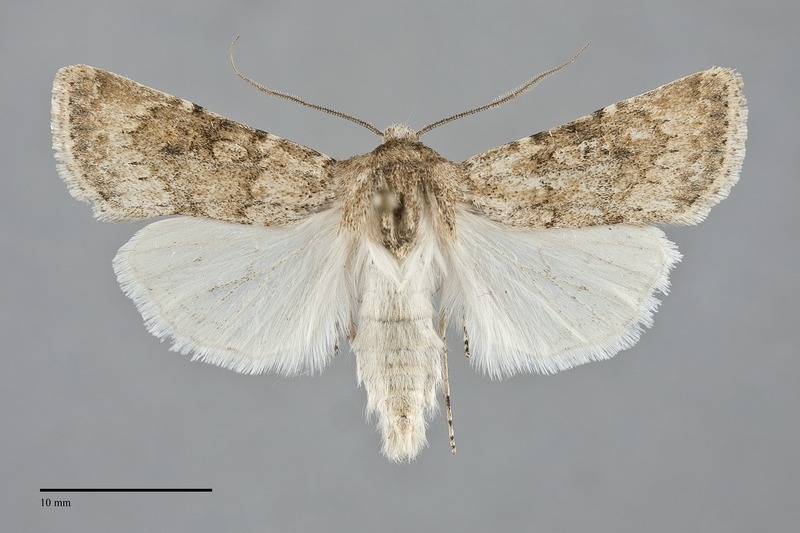 Euxoa cona is a member of the large subgenus Euxoa. 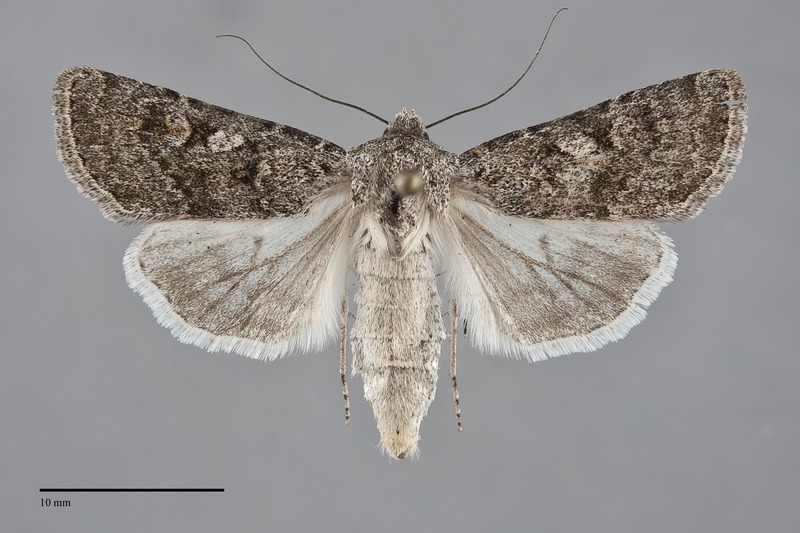 This species can usually be identified by its late season flight, pointed forewing, dusty gray-tan color, oval orbicular spot lacking an ocellus, and strongly toothed postmedial line. Similar species include Euxoa misturata, Euxoa satiens, and Euxoa pallipennis. 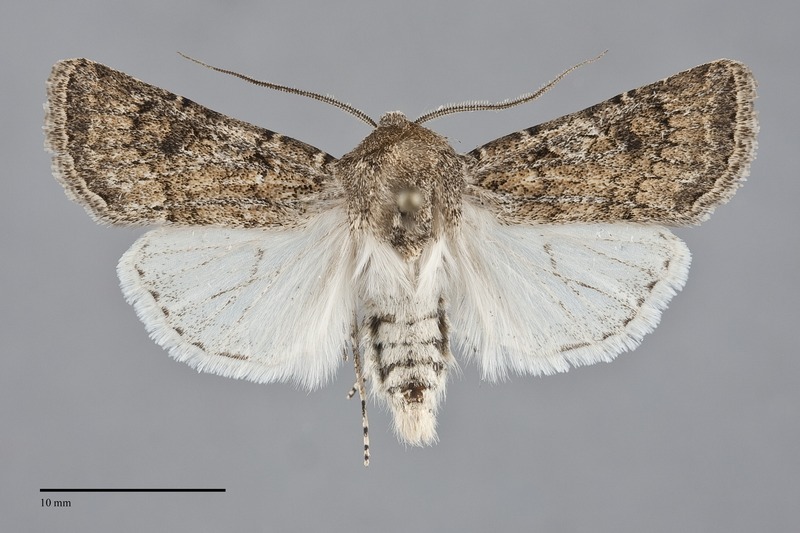 Euxoa misturata usually has a less pointed forewing shape, is marked with a sharply-toothed W-mark on the mid-wing, and has a smaller oval orbicular spot that usually has a dark ocellus in it. Euxoa satiens has a larger orbicular spot, but it also has a dark ocellus. Its hindwing has dark veins near the margin in males and across the entire wing in females. Euxoa pallipennis is a smaller and more typically pale species than E. cona but could be confused with small lightly colored individuals of it. It is less powdery, grayer, and has a smaller oval orbicular spot. This species is widely distributed in low-elevation desert habitats of western North America. In the Pacific Northwest, it is mostly restricted to sand dunes and other barren habitats, primarily in the Great Basin region. It is found uncommonly in typical sagebrush habitats. This species is most commonly collected in southeastern Oregon where it occurs as far north as the south slope of the Blue Mountains. A single record exists for Benton County in south-central Washington. It is also listed as occurring in southern Idaho in Lafontaine (1987). This species occurs in the Intermountain Region of the American West, with a small population in the adjacent portions of Montana and North Dakota. The range includes western Colorado, central Utah, Nevada, and eastern and southern California. Adults occur in the late fall, with records from September and October in our region. It is nocturnal and comes to lights.